MRF’s are becoming increasingly important to our communities as they form part of the long term integrated waste management strategies of Local Authorities and Waste Management companies. MRF’s enable them to meet legislation, avoid rising landfill charges and deliver an environmentally friendly, sustainable service. Clean MRF’s – are plants which process only dry recyclables that are separated at source by the householder. This source separated waste is usually a mix of fibres – card, papers, newspapers, magazines and textiles – and commingled containers – plastics and cans – and is put out for separate collection. 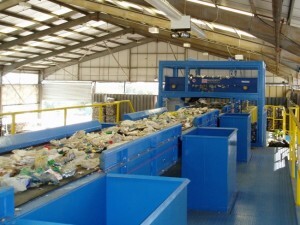 Mixed Bag MRF’s – receive both source-separated waste and mixed waste (MSW) simultaneously and divert as much of both as possible from landfill. Dirty MRF’s – divide residual municipal waste into a recyclable material stream and a non-recyclable residual waste stream disposed to landfill. More advanced plant may be used to produce a third stream either a primarily biodegradable waste stream which can be sent for Anaerobic Digestion or In-vessel composting or a relatively high calorific value stream for conversion to Refuse Derived Fuel. Fully-Automated MRF’s – automated systems offer higher throughputs and reduced operating and sorting costs and consistently higher recovery levels. New UK Government Legislation to reduce household waste to landfill by recycling/composting by 45% by 2015 means the GAME Waste Handling Systems are vital in helping companies and local authorities meet these targets. Designed for the toughest environments to give years of reliable service. Automated systems available for higher throughputs. Variety of modular systems available, designed by GAME to suit specific client requirements. One-stop shop for all your needs.